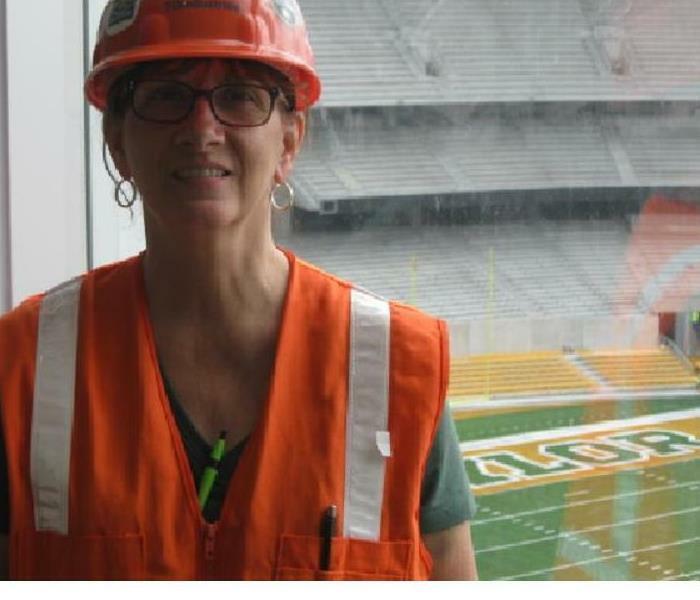 Actually, SERVPRO of Waco Fire & Water - Clean Up & Restoration contributed to the opening with water remediation and water restoration jobs at McLane Stadium in the mad rush just prior to the opening day. As the British say, we got a bit "cheeky" about standing in front of the windows and acting like tourists getting pictures with the views. And yet another Baptismal Story. While a very holy ceremony, churches practicing full immersion baptism are rife with stories, often funny, of incidents related to baptisms. Some are of kids diving in the water, the water heater not working...the drain separating and causing the waters to flow into the sanctuary and surrounding areas on its way back to the river, just to name a few. This drain caused a water damage when the water was drained at a church in Glen Rose, TX. SERVPRO of Waco Fire & Water - Clean Up & Restoration was able to extract the water and dry things up nicely with minimum disruption. This is actually a very important tool at our Waco warehouse. It is our "boss lady get the bugs" broom. It can, however, get left a little to close to the cord for the overhead door. Yes, everything always goes smooth as a whistle at SERVPRO of Waco Fire & Water - Clean Up & Restoration. 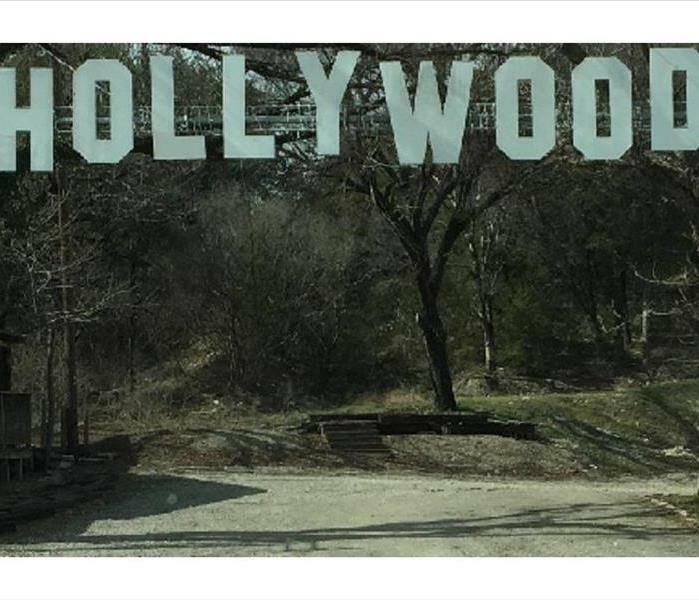 Say like... Glen Rose, TX. This was on our way to a water damage restoration at a church. Too cool not to take a picture of it. 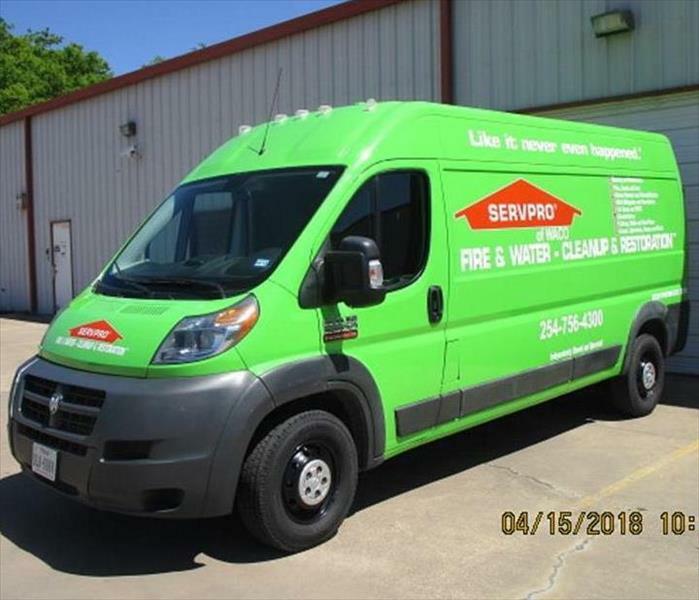 Here is the SERVPRO of Waco Fire & Water - Clean Up & Restoration Promaster in shock in Woodway, TX, after finally being waxed. We let the custom paint job bake on real good. Ten or eleven months is a good bake, right? It will probably never look better. Except, of course, when it shows up at your place when you need some help with a water damage restoration, fire damage restoration, mold damage restoration or storm damage restoration. 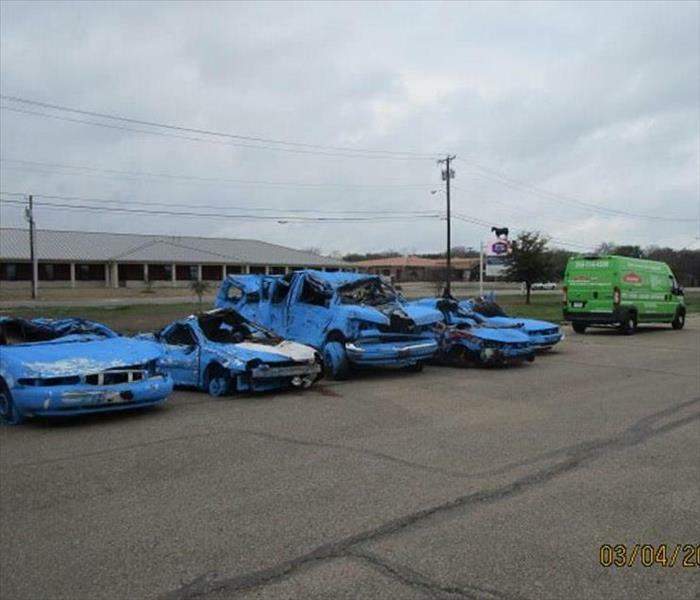 The SERVPRO of Waco Fire & Water Clean Up & Restoration Promaster successfully jumped several vehicles at the Heart of Texas Fairgrounds. There was some collateral damage though. And Blue men may be upset. Well, that's our story, and we're sticking to it. We will, however, jump right on your water damage restoration, mold damage restoration, fire damage restoration or storm damage restoration should you find yourself in that situation. Sunshine on my...furnitures...makes me happy. 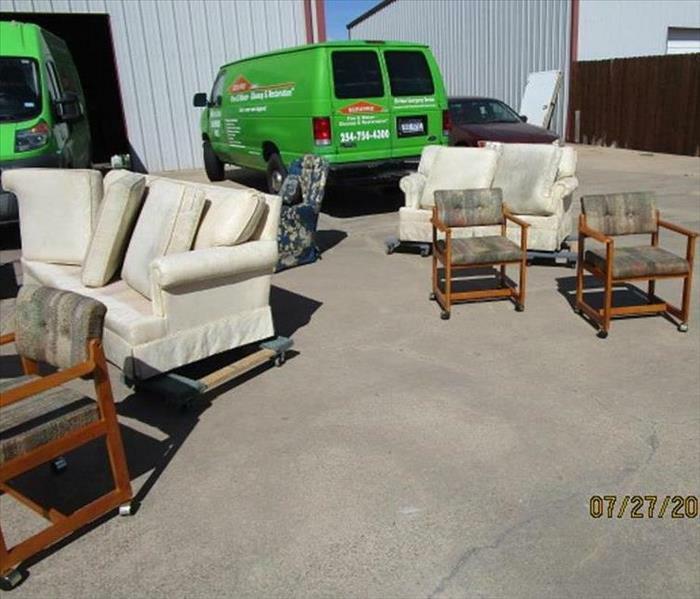 If we at SERVPRO of Waco Fire & Water - Clean Up & Restoration can, we like to get freshly cleaned upholstered furniture into the sunshine to dry. It helps freshen it up while drying. This furniture, from a Waco, TX, fire damage had some tobacco smell issues as well. Sometimes flooring, drywall and other items just have to go. The carpet and pad here was pulled out by the customer from their water damage restoration in Whitney, TX, and we retrieved it from the back yard. Normally we at SERVPRO of Waco Fire & Water - Clean Up & Restoration bag up more than is shown here. Fortunately, our expert tarping kept it all in the trailer. Yes there is a trick or two successful tarping. Wish we'd learned that the easy way. If you find this in your shower, tub, etc., such as in this one in the Lake Air area of Waco, TX, it means your drains are plugged somewhere between here and the street/septic system. SERVPRO of Waco Fire & Water - Clean Up & Restoration for water damage clean up if it overflows significantly. Oh, and don't run any water of consequence inside the building until you know where the stoppage is located. 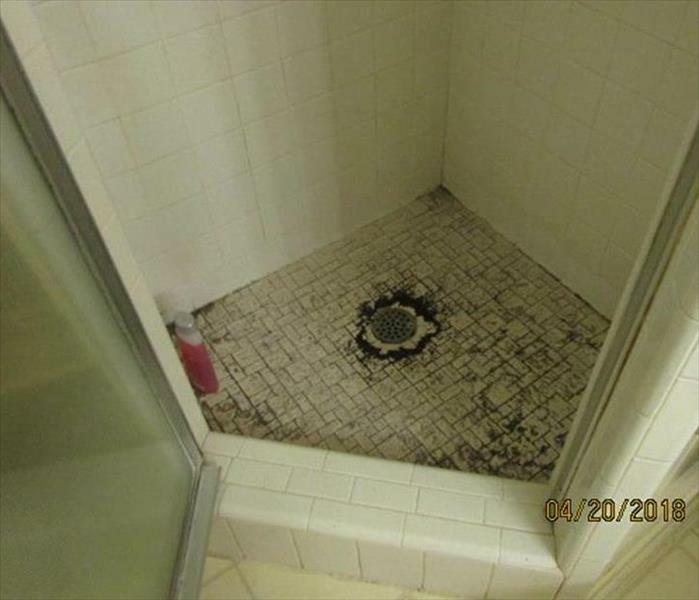 No one wants the washing machine or their bath to drain onto the floors. 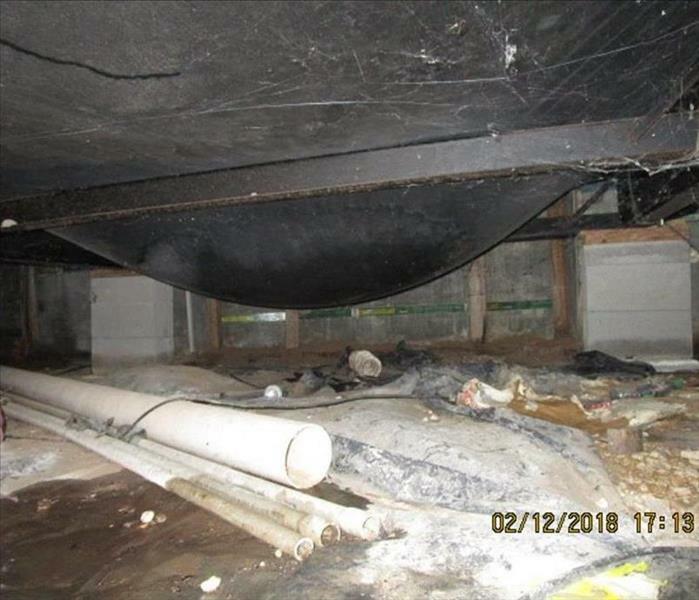 This, my friends, is what it looks like under a manufactured home that suffered a water damage leak. These homes have strong tarps under them which will hold water. Lots of it. 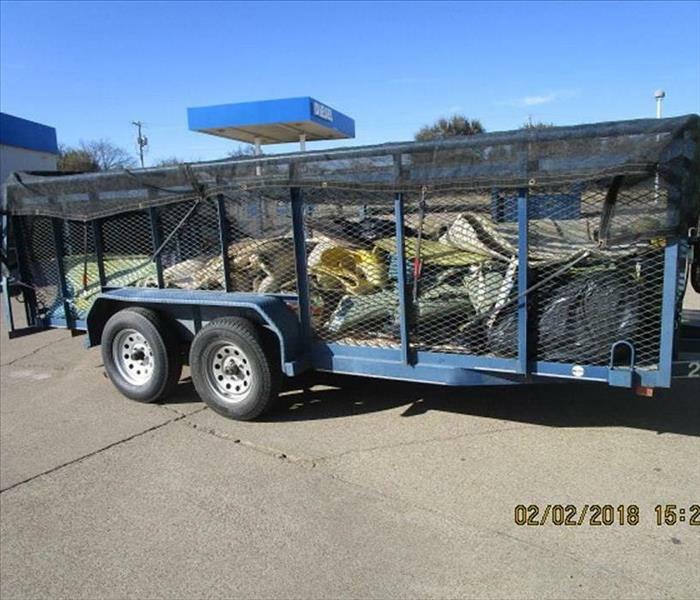 We at SERVPRO of Waco, have seen them stretched clear down on the ground. With the HVAC vents in the floors, they act like a drain system, but aren't water tight. They have to be cut open to get the evaporating moisture out of the building and get wet insulation off the floors/joists. When cut open the water really gushes out of these. One has to be skilled to cut these open and be out of the way of the water. Unlike me, who misjudged this one in Whitney, TX, and had the water and that pipe laying there come right at me. The pipe did hit me, but not hard. Worst part was getting water down in the rubber boot. That thing still smells. Oh, oh, too much information. Leaking here? You Gotta Be kidding! 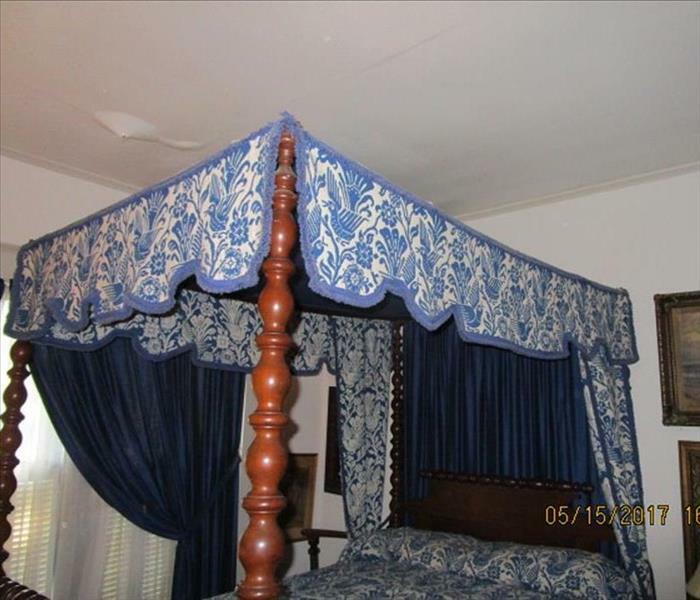 Very desirable antique bed, antique rug, antique dressers, even antique china (lots of it)...and it has to leak here in this Waco, TX, water damage. Just above the left foot board bedpost. We at SERVPRO of Waco Fire & Water - Clean Up & Restoration find water just seems attracted to small spaces, storage areas and, of course, china cabinets. No kitty cats, or anyone else, were injured in this Hillsboro, TX, fire damage...just a made a big mess. Customers did a wonderful remodeling job afterwards. Moved walls and everything.